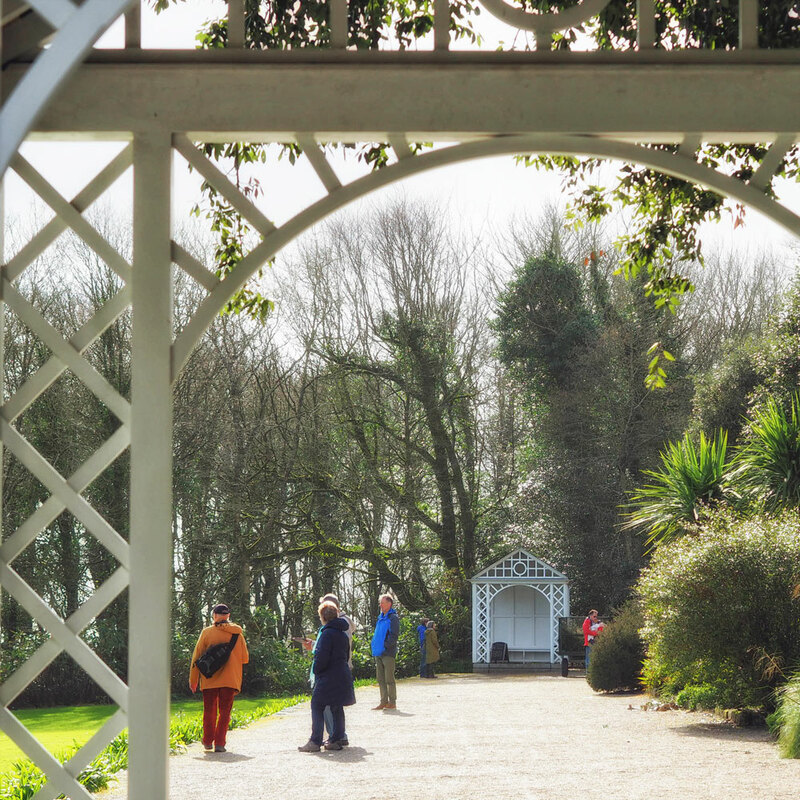 Cornish gardens are notorious in early spring for their abundance of Camellias, Magnolias, Azaleas and Rhododendrons. And this year I am trying to visit as many as possible. In addition to the exercise we get by walking the miles of footpaths, I get to indulge my passion for flowers and my love of photography. Trengwainton (NT) gardens in nearby Madron are not open all year round, but they are now, so a couple of weeks ago on a sunny, though showery afternoon we decided to go for a walk. The south-facing garden has a uniquely warm micro-climate, meaning that half-hardy and tender trees, shrubs, and other plants thrive here even when they cannot survive in the open anywhere else in Britain. Along with the usual spring plants there are many wonderful tree ferns and hydrangeas. 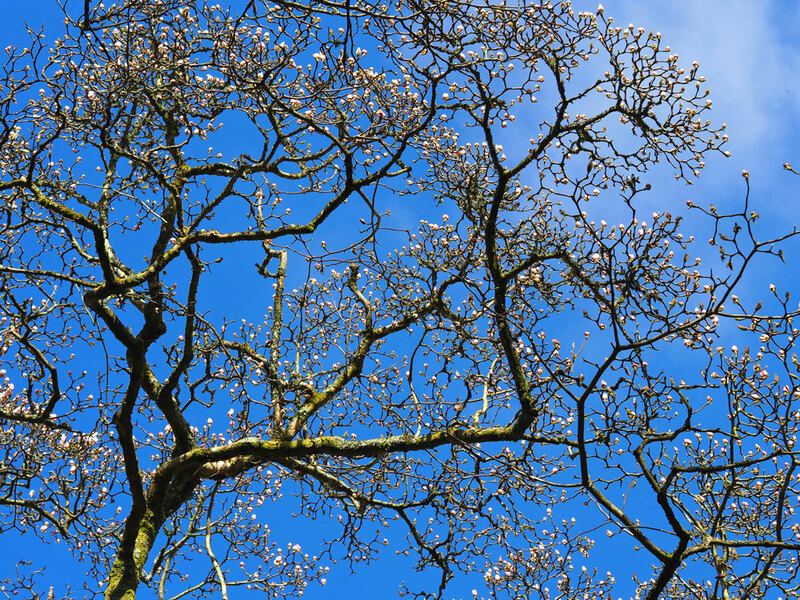 Large Magnolia trees reach for the sky with tiny diamonds at the end of their branches. The route we usually follow is to visit the brick Walled Gardens first which are in the exact dimensions of Noah’s Ark according to the Bible, and because the brick holds the heat better, the gardens are practically frost free and enables vegetables to be planted quite early. This early in the year though there is little to be seen, but we had some books to drop off at the second-hand book shop which is beyond the walled gardens and in the orchard area. 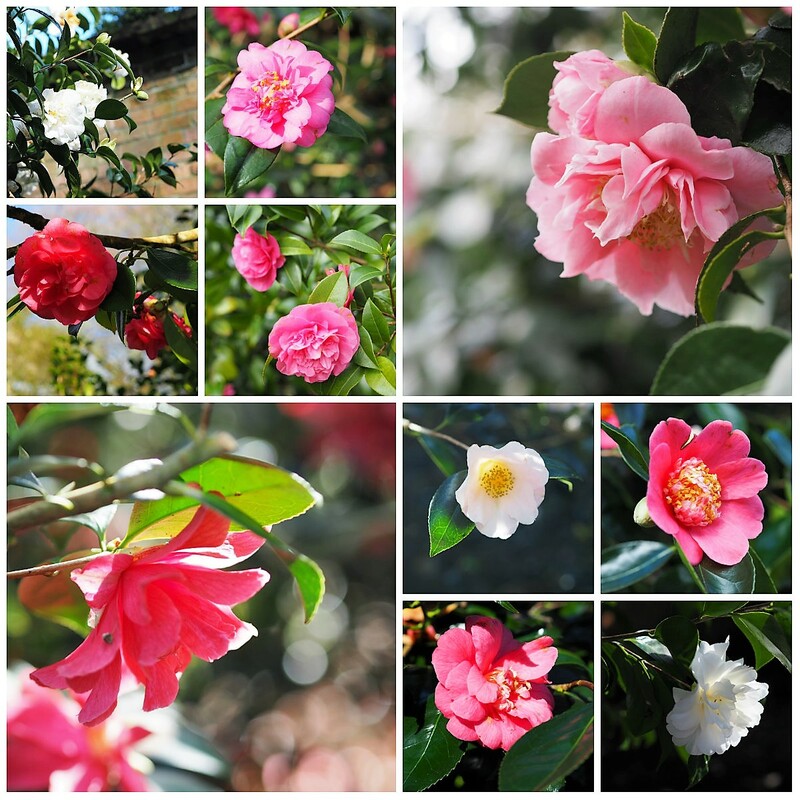 There is a Camellia walk which winds around and back onto the main tarmac road which leads to the house and terrace. 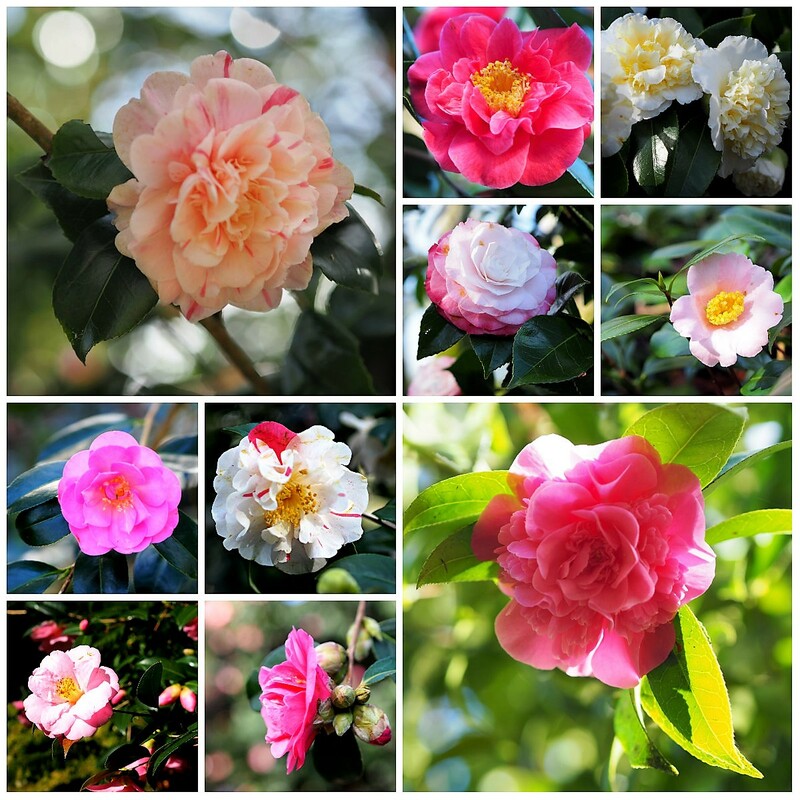 I cannot get over how many different colours, shapes and sizes of Camellia there are. Each and every one like a spring Rose. Where a quiet stream and bog garden is laid out along the meandering course, offering a home to bamboo, lilies, primulas. Yet more winding pathways take you through woodland areas with daffodils, bluebells (yet to come) and many, many hydrangeas planted along the edge under the tree canopy, leading to a Tree Fern grove and a little pond with a wooden bridge. 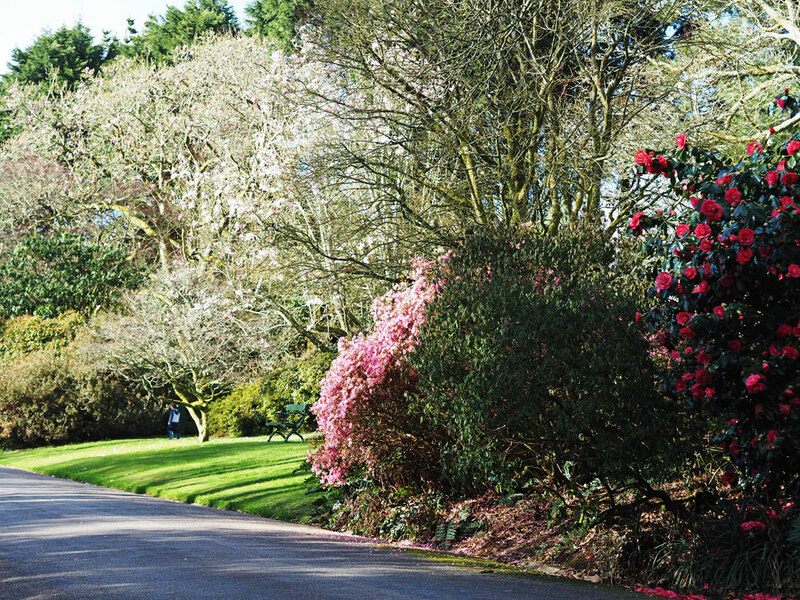 Azaleas, Rhododendrons and more Camellias can be found here. This path brings you out close to the house (private) and a wide terrace with views over Mount’s Bay. The terrace has two wooden arbours (one a silent zone) and several benches from where you can rest and drink in that view. 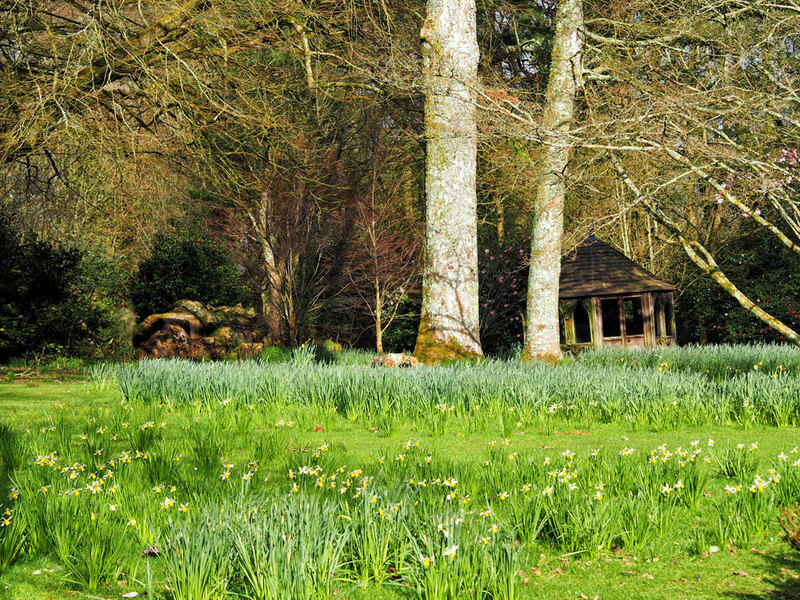 Making our way back along the road we stop to look at the mass of daffodils planted in the lawn and the large Azaleas alongside. Here bunnies play hide and seek whilst robins and blackbirds sing in the trees. In fact the only noise you hear in this garden is birdsong. Discarded camellia petals carpet the ground in places, Spring Snowflakes and Hellebores shimmer in the undergrowth and a large pink Magnolia hides its flowers high above our heads. We make our way out of the grounds (pausing only to purchase a Euphorbia amygdaloides ‘Purpurea’) to the tea room where you can treat yourself to a healthy lunch or simply coffee and cake. We just had coffee on this occasion as we were too late for lunch (12 – 15:00), but we will certainly be returning for one of their delicious sounding salads. Once again I am struck by the similarity of your flora and those of the Pacific Northwest states where I lived for so many years. New England is vastly different. I do miss the PNW, but I love New England too. I just wish we had a slightly longer growing season which would allow some of your flowers and plants. I had not realised how cold it gets in New England. Our little patch has at least a five or six weeks shorter growing season. That’s quite significant. But you do get that lovely Fall colour over there. Yes. And wonderful maple syrup. If I had to pick one flowering tree to be my favourite, it would have to be the Grand Magnolias. I really miss visiting English gardens. No doubt why I love volunteering down at The Elms as there are so many well-established trees over 100 years old. I couldn’t pick a favourite flowering tree, they are all so beautiful, but I know what you mean about the Grand Magnolia. Such an enormous flower. Yes, I agree they are all beautiful especially when there is low rainfall. In answer to your question, no! Camellias are beautiful and I would have many if I had the space. This garden looks gorgeous. I hadn’t realised they had so many Camellias here, but they do! And this year they are looking fabulous. How many times have I told myself we must make a visit to Trengwainton? It looks beautiful. Hopefully it had avoided the frosts we’re having this week. It is a very sheltered garden so may have been lucky. I have only seen frost once this week in the fields, nothing in my garden appeared to be touched. I love the varoety of weather conditions within Cornwall. In our eastern spot, with a microclimate of its own, we have had heavy frosts every morning this week. Beautiful – but with a cost! 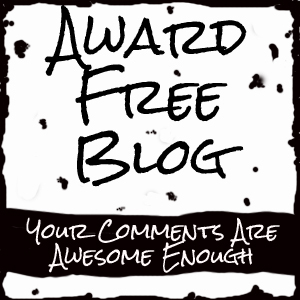 I popped over to your blog – I see you moved to Cornwall on the exact day that we did! 31st March 2016. So whereabouts are you located? Liskeard? Looe? Or further north. Only time we have been to both Looe and Polperro it was pouring down! Must do another visit in better weather. Both places have their charms. Even in the rain. I agree with you thought about Penwith – it feels quite different. I love it ‘on the ‘edge’. Penwith was just a step too far with family based in Kent so I content myself with visits west from here. Yes, we are a little remote! We sometimes think we will have to move eventually to a place with amenities, whether still in Cornwall or further east we haven’t decided. All the more reason to enjoy the here and now! Ah, spring in Cornwall, you can’t beat it. I love all the camellias and magnolias, just beautiful.